Have you ever wondered how exactly Hot-Air Balloons work? 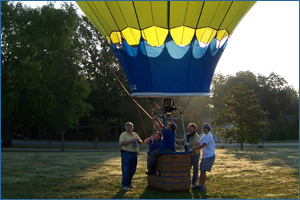 Below is an overview of how hot air balloons fly and the systems that make them up. When air particles are energized by heat it becomes less dense than cooler air, and because of that it rises; floating on the top of the cooler air below it. In nature this is known as a convection cycle; the sun heats the earth, the air above the surface heats thus shifting it upward, this is also the natural cause of wind. Hot air balloons artificially heat the air inside the balloon and creates a 'bubble' of hot air inside. This mass of warm air allows the balloon to become buoyant and rise through the cooler air around it. 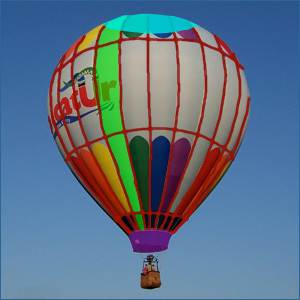 To produce the hot-air that allows a balloon to fly the aircraft must carry its own fuel and heat source to create enough hot air to allow it to lift several hundred pounds off the ground. 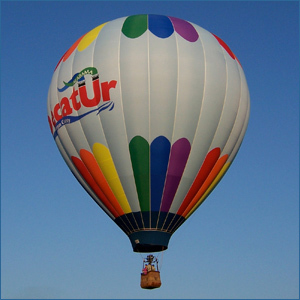 Below are pictures and explanations of the major equipment makes up a modern hot-air balloon. 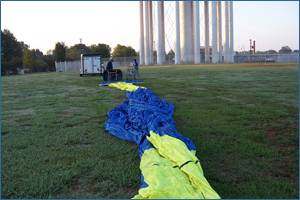 Each component is essential to the safe operation of the aircraft and the FAA requires careful maintenance and review of every balloon by the pilot before each flight and a yearly inspection done by certified repair station. 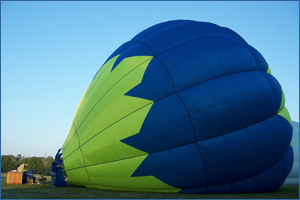 The envelope of a hot-air balloon is the colorful bag of coated rip-stop nylon or polyester fabric that holds the air that lets a balloon fly. The envelope is made up of many components. Highlighted red are load tapes that hold the envelope together. Green are gores, strips of fabric between the load tapes. Highlighted pink is the skirt that blocks wind. At the top is a large vent simply called the top, that allows the balloon to be deflated. The basket carries passengers. A basket is built out of hundreds of woven wicker rods. On top of the basket are uprights, metal or wood supports that form a frame for the burner, and connect the envelope to the basket by cables or kevlar ropes. The burner produces the heat to fly. It uses liquid propane directed as a jet of flame into the envelope. Burners have cone shaped tubes called coils. Small jets inside produce the flame fired into the envelope. A pilot light remains lit to ignite the jets when they are fired. And an assortment of valves to control the burner. 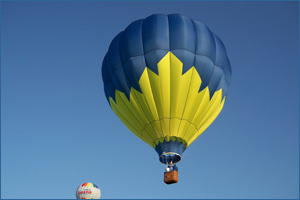 A balloon carries between one and four stainless steel or aluminum propane tanks. Flights last about an hour but different conditions cause more or less fuel use. The hotter the day less time and weight the balloon can carry and the more fuel it uses. Each tank is tested and re-certified by a yearly inspection. A balloon carries a few aircraft instruments. 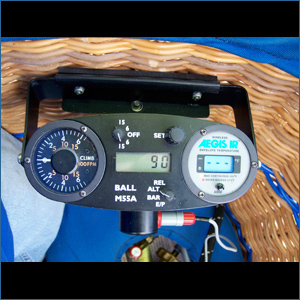 An altimeter measures the distance above the ground, sea level, or density altitude. A pyrometer to measure the temperature at the top of the balloon, and at the basket. A variometer measures the rate ascent or descent. Last, a timer tells how long the balloon has been in the air. 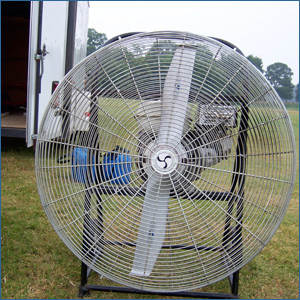 An inflator fan is a large fan used to push cold air into the balloon to ready it for hot-inflation and flight. The fan is often an airplane prop mounted on a small engine and surrounded by a cage for safety. 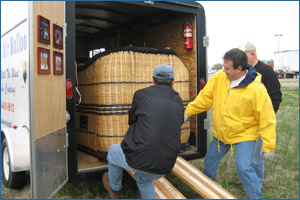 Hot Air balloons are stored in open or enclosed utility trailers and the balloon dissembles for easy storage. First to come out are the basket, uprights, and burner which is all assembled. Next the envelope is extracted and connected to the basket. 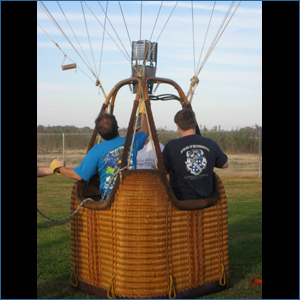 The envelope is stored in a large canvas bag, to inflate it is pulled out in a long narrow line downwind from the basket. Once the envelope is ready the fan is retrieved from the trailer. 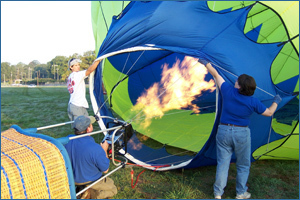 Two crew members are assigned to hold the mouth of the balloon open as another holds the balloon by the crown line to prevent it from rolling around. 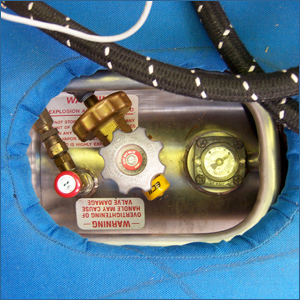 The balloon is first inflated with cold air on the ground by an inflator fan, which is similar to fans often used by fire fighters to clear buildings of smoke. 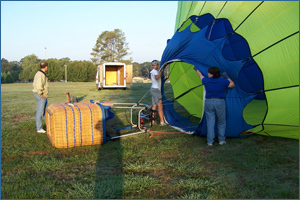 When the balloon is full of cold air the pilot determines it is time to hot inflate which will raise the balloon from the ground into the air. To do this the same principals that allow a balloon to fly are used. The pilot lights the burner and fires a stream of flame into the envelope, heating the air within. 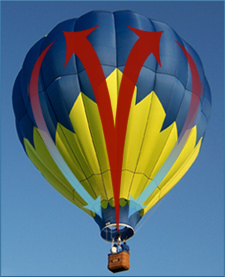 As the air temperature increases the balloon becomes buoyant and rises off the ground. 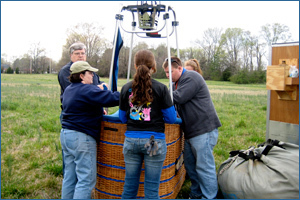 Once the balloon is up the crew leans on the basket to provide weight to keep it on the ground, since inflation can make the balloon lighter than needed. 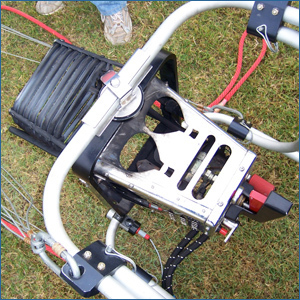 Before flying the pilot re-checks all connections, instruments, and equipment; then will ask any passengers to enter the basket. Then you are ready to take to the skies!